BACKGROUND A member of the Leading Hotels of the World, the five-star deluxe Hotel Hessischer Hof is owned by the Hessian princely family, and was formerly their city palace. Since 1952 it has been operated as hotel – and is the only privately-owned one in Frankfurt. Prince Donatus of Hesse plays an active role in the development of the hotel as co-managing director, and the interiors of the new Executive rooms were designed by Princess Floria of Hesse. WHAT’S IT LIKE? The 107-room property is divided into three buildings. Despite period furniture and reams of antiques owned by the royal family, the hotel manages to maintain a homely, comfortable atmosphere. 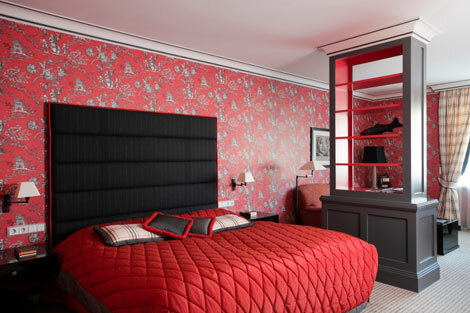 An executive floor was added in September last year, which offers more contemporary décor and a more spacious layout – but the rooms still adopt the classical character of the rest of the hotel through the antiques and paintings they hold. Upon arrival, you are greeted with a concierge service and a welcome drink, which you can claim between 6pm and 8pm in the hotel’s “Hospitality Lounge”, a living-room area beside the lobby, that links onto a conservatory, or “winter garden”. WHERE IS IT? Situated across the road from the Messe Frankfurt, the hotel’s location couldn’t be better for those attending events at the venue’s conference halls. Frankfurt’s business district is around 500m away, and a taxi ride from the airport takes around 15 minutes, costing €25-€30. ROOM FACILITIES I stayed in one of the new Executive rooms on the third floor. The room was extremely spacious with warm homely décor. The layout was open plan, with the sleeping area divided from the lounge area by a central floor-to-ceiling green bookshelf, which was empty apart from a couple of magazines. The lounge area had a window that looked down on the hotel car park but also faced out towards some skyscrapers. The window was bordered with Burberry patterned curtains that matched the cushions on the comfy terracotta sofa. The room’s flatscreen Samsung TV could be viewed from either area of the room – it had a variety of channels, most of which were in German apart from BBC World, Aljazeera International and Bloomberg Europe TV. There was a free minibar fridge at the base of the bookshelf which had beer, sparkling wine, and orange juice, and there was a complimentary fruit bowl and bottled water on the coffee table when I arrived. The sleeping area of the room had a king-size bed with two single duvets and large pillows which I could really sink in to. The headboard was upholstered in a pin-stripe-suit material, which was also on an armchair elsewhere in the room. The cream wallpaper, square ceiling lights and small imitation 19th-century desk and chest of drawers reminded me of a family home – and there were features that felt as if they’d been carefully chosen, such as the antique clock on the dresser with a bronze Greek goddess, the framed Victorian-era animal sketches and the carved candleholders. The bathroom was really impressive – it was huge with cream marble surfaces and lots of lighting. There where two large rectangular basins, a bath with a shower as well as a walk-in shower with both a rainshower head and a movable showerhead, and a separate cubicle for the toilet. There were Molton Brown products on offer, as well as robes and slippers. The room also had a laptop safe in the cupboard, air conditioning and free internet (as with all areas of the hotel, ask for the password). There were no tea and coffee-making facilities. RESTAURANTS AND BARS Proudly on display in the Sèvres restaurant (French for porcelain) is a wall of porcelain croquery -a gift from Napolean Bonaparte for the royal family. 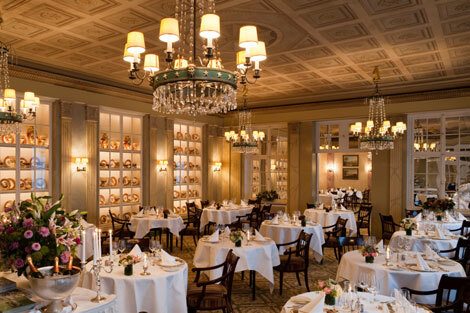 The restaurant serves a champagne breakfast buffet for guests (from 7am-11am) in sophisticated surroundings that are reminiscent of a Jane Austen film-check out the tromp d’oeil ceiling roses and wall columns, and the four chandeliers adorned with Greek gods and stars. The buffet includes smoked salmon, sausages, scrambled eggs, bacon, cold meats, cheeses, pickles, bread rolls, cakes, a variety of yoghurts, cereals, sliced fruit and a wide selection of blended teas (coffee and water are served to your table). There’s the option of a business lunch, which consists of a three-course menu and wine from the family vineyard, costs €39 per head and is served from Monday-Friday, 12pm-3pm. A candlelit evening dinner is available from 6pm – a three course menu including wine, water and coffee is €45. Jimmy’s Bar – an American-style bar – is allegedly the place to be in Frankfurt during the early hours of the morning. As you enter the dimly-lit space, you see a porcelain laughing Buddha amid leather booths and chairs, and you’re hit by a waft of last night’s enjoyment of the cigar cupboard. The place has character of a gentleman’s club and a strong sense of tradition – it has been managed by the same guy for 35 years. Open until 4am, hot food is served until 3am and there is live piano music every night. BUSINESS AND MEETING FACILITIES The hotel’s nine meeting rooms all offer free wifi, daylight and air conditioning. Each room is said to tell a different story, and reflect the royal family’s love of travel. For example, there is a large boardroom with an Indian mural, another Roman-themed room with a stone carving upon the wall and another with Japanese artwork. The most impressive space is the Atrium, below the Executive floor, which has both a removable glass ceiling, an outdoor terrace, and a colonial-style mural of the “discovery” of Brazil painted on the walls. The largest event space can hold up to 300 people and has an outdoor terrace that runs the length of the room. LEISURE FACILITIES Currently the hotel does not have its own gym or spa. However, guests have free access to the Mainhattan Sports club, which is a one-minute walk from the hotel and is open from 7am-11pm. Guests can also request in-room spa and massage treatments, and the hotel plans to open its own spa area next year. VERDICT A traditional hotel with distinctive meetings facilities, a great location for business and excellent service. HOW MANY ROOMS? 107 in total – 82 Standard Rooms, 28 Executive Rooms and seven Junior suites. ROOM HIGHLIGHTS The extremely large bathroom and the free minibar, which gets re-stocked every night. PRICE Internet rates in October start from €195 per night.